Union Trust, one the Finley Catering wedding venues in Philadelphia, is one impeccable and spectacular place to have a wedding celebration. As wedding photographers, we always look for creative and unique ways to photograph our brides and grooms. One of our favorite types of photos are the photos of the bride and groom in the empty reception room. We believe it is makes a wonderful memory of all the hard work they completed and a beautiful day they created for their loved ones. 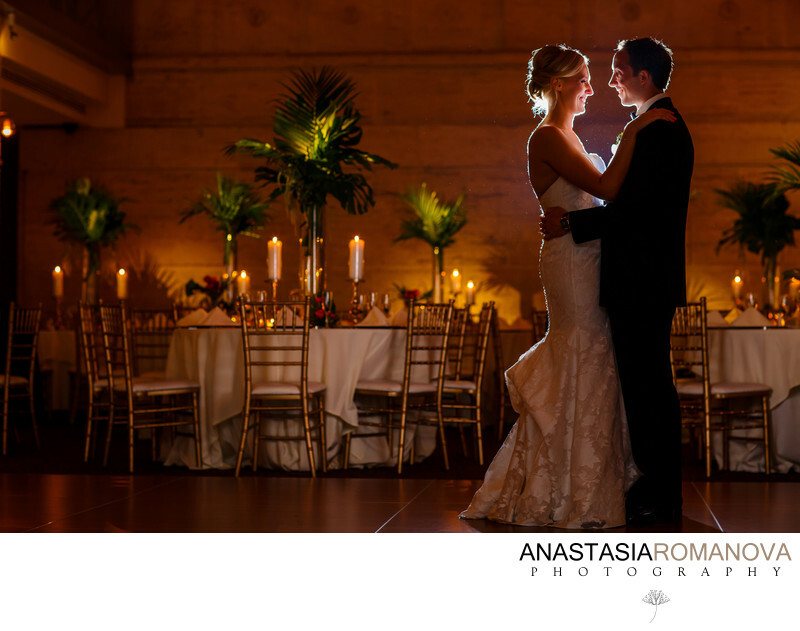 This photo was taken at one of the wedding receptions we had an honor to document at the Union Trust in Philadelphia. The bride did a tremendous job styling everything in a safari theme. The palm centerpieces beautifully paired with candles created a very soft subtle atmosphere and looked vibrant and bright on the stone wall background. We knew that the bride and groom would highly appreciate these reception decor photos as they put so much of a hard work to put all these delicate details together. We positioned the couple slightly off the center of the dance floor, leaving some distance between them and the reception tables as out main backdrop. We didn't want to have their faces lit too bright. Instead, the idea was to create a gentle rim of light behind them that would contour their silhouettes. To achieve this result, one off-camera flash with a MagMod grid was placed approximately 5 feet behind the couple.